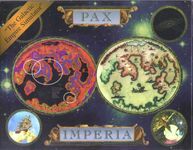 "Pax Imperia is turn-based or real-time space strategy game released for Apple Macintosh in 1992. Pax Imperia: Eminent Domain was released in 1997 as a sequel. Pax Imperia is a Latin term, meaning peace from empire." Source: Wikipedia, "Pax Imperia", available under the CC-BY-SA License.